Along with our thermal transfer labels, we provide the highest quality thermal transfer ribbons in three varieties to match the selected label material. 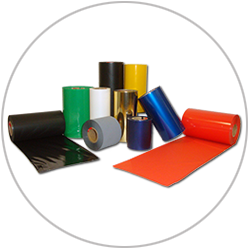 Wide range of Resin ribbons for printing on high durability polyester and polyamide materials in various applications. Wax/resin ribbons for printing on chromo paper and synthetics. CCL Design Israel utilizes a unique core part number marking so you can easily identify which ribbon is loaded on the printer without needing to remove it. we offer our ribbons in any shape or size to fit our customer needs.